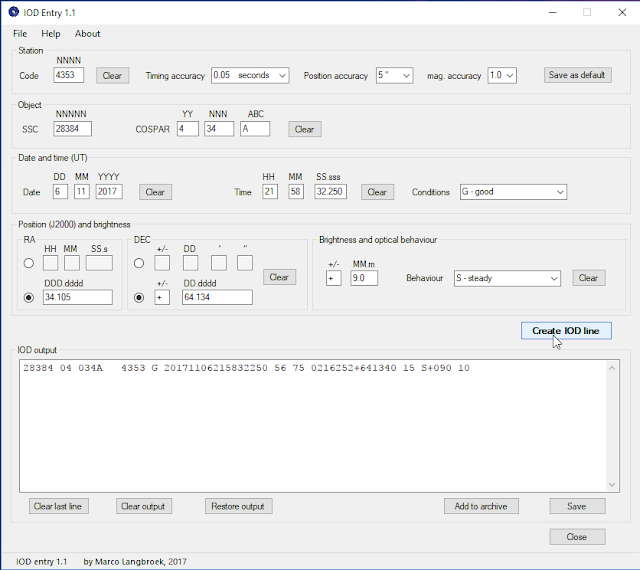 International amateur satellite observers (well: apart from the British, who use their own format) generally use the IOD format to communicate positional measurements on satellites. The IOD format however can be cumbersome and error-prone to manually write. 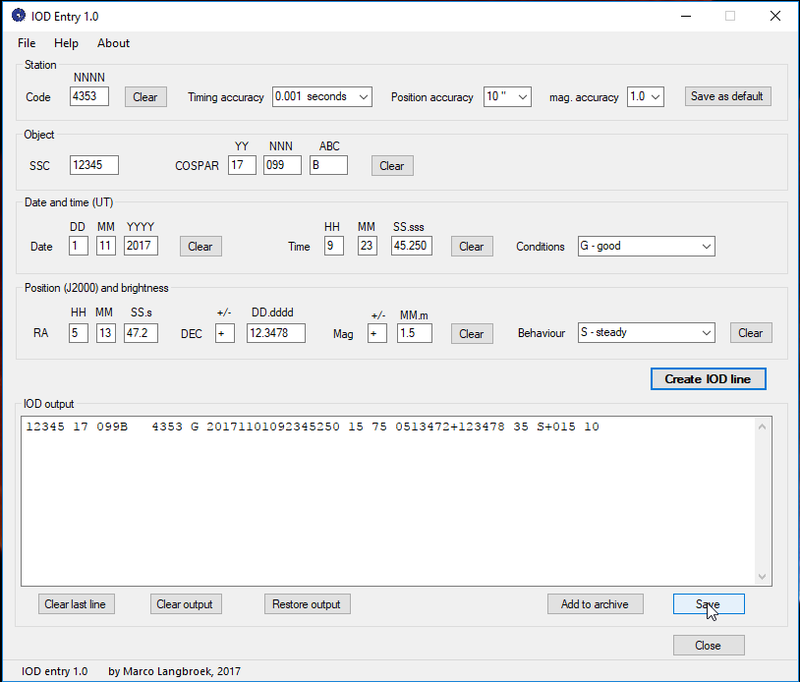 In the old days, there was a neat little DOS program called ObsEntry to help you turn your data into IOD format. Unfortunately, this no longer works on newer Windows machines. Time for something new to replace it: so I present to you IOD Entry 1.0! IOD Entry 1.0 is software that runs under the Windows .NET framework, which is a standard component of Windows 7 and later (otherwise, the .NET framework can be downloaded here). I wrote it in Visual Basic using Microsoft Visual Studio 2017, as part of self-teaching me to code .NET windows applications in Visual Basic. The program and how to work with it is described in detail in this Satobs.org mailinglist post. The program can be downloaded as a .zip file through my astronomy software page at http://software.langbroek.org. It is (of course) freeware. 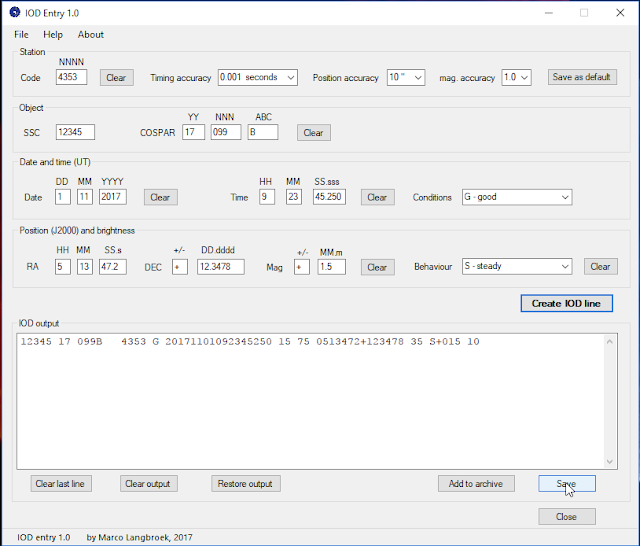 UPDATE: IOD Entry version 1.1 has now been released. It allows to choose the format of both the Right Ascencion and Declination entries. For the RA, the choice is between HH MM SS.s, or decimal degrees. For the declination, the choice is between degrees, arcminutes and arcseconds, or decimal degrees. Version 1.1 can be downloaded at the same link above.